It wouldn’t be a party without a wonderful tablescape. But no one wants to bust the budget setting the table! 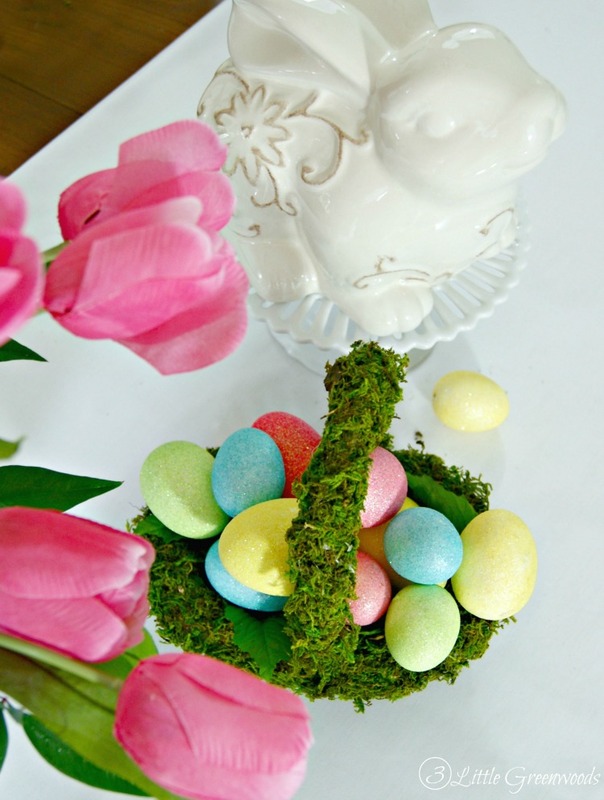 Today I am excited to share Five Fabulous Thrifty Table Setting Ideas for Easter! Whether I am setting the table for Christmas, Ladies Night In, or Easter, the first thing I do is shop my own home for pieces that will fit with the theme. Most of the time there will be enough to fill the table without having to run out to purchase a bunch of new things. Over the years I have gathered sets of dishes, glassware, and silverware that help lay the foundation of a tablescape. Many of these pieces were wedding gifts. 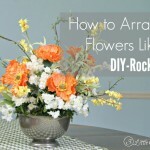 A lot were bought at Goodwill and are perfect for creating thrifty table setting ideas. After pulling out all my goodies this is Easter tablescape I pulled together for this year. The little ceramic cabbage was a gift from my grandmother. It reminds me of Peter Rabbit stealing cabbages from Mr. McGregor’s garden. 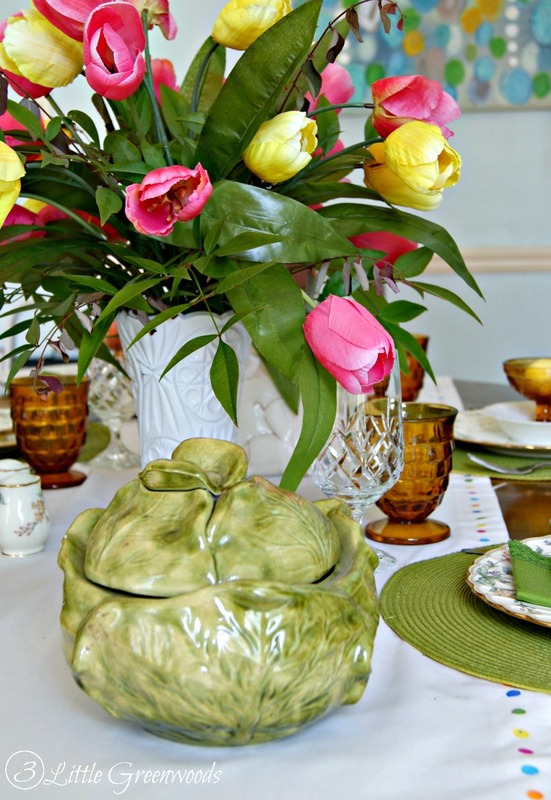 I love it’s glossy green color on our Easter table. Once I cleaned my disaster of a craft room I realized there were enough flowers to started a florist. 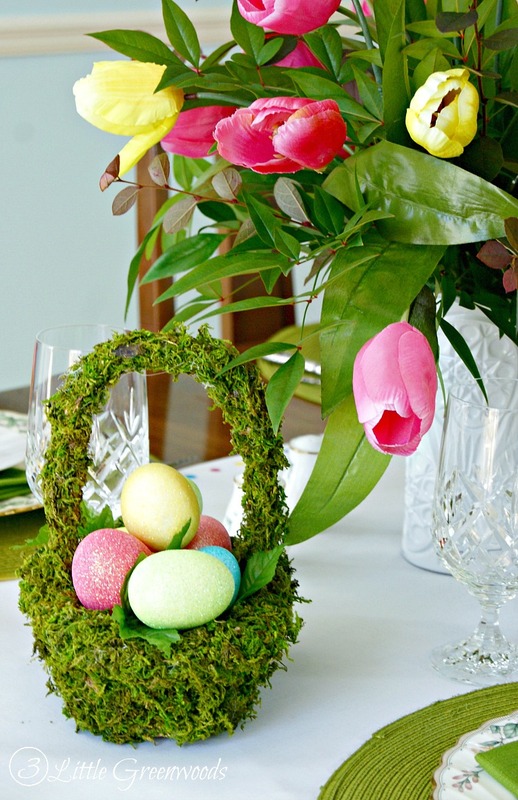 The Easter table centerpiece was created from faux tulips I already had and snips of greenery from the backyard. Nandinas are my favorite for filling in floral arrangements. Shopping at our local Goodwill always gives me lots of thrifty table setting ideas. Whenever I have a few minutes before preschool pickup I always drop in to see what I can find. The children call it “Mama’s treasure store” because that’s what I tell them I am looking for when I shop there. The housewares section is the first stop. Since white makes food look good white dishes and serving pieces are constantly at the top of my list. Plus all white goes together making the mix-matched pieces look like a collection. Having an excuse to lay out the wedding china is always welcome but it can be a tad formal. Adding white thrift store plates to our fancy dishes breaks up the pattern. There is always a huge bin of tablecloths, placemats, and napkins at the thrift store too. The round woven placemats were a thrifty find from last summer. One coat of spray paint and they went from moldy yellow to grass green. Click here for the complete spray painted placemat tutorial. 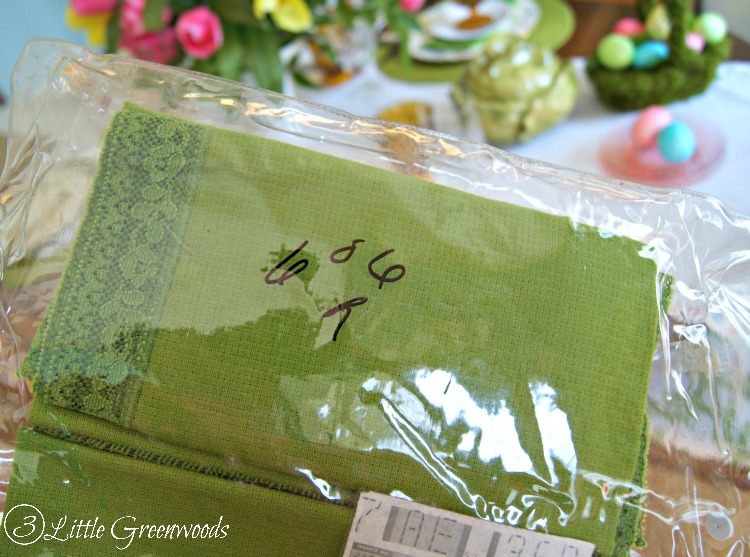 I picked up the lacy green napkins on half off day. There were eight napkins carefully folded inside this plastic bag. They were in pristine condition and only cost $3.03! I’ve already used a few of them on the faux wood bookcase our home office. Every table needs a centerpiece. I’m always on the hunt for interesting vases and snagged this plastic one for less than one dollar. A coat of white paint plus a little sanding and I’ve got a shabby chic vase for my Easter tablescape! Isn’t it always the case? You spot something fabulous in a home decor store or catalog and you love the look but not the price tag. That is exactly what happened to me a couple of weeks ago. 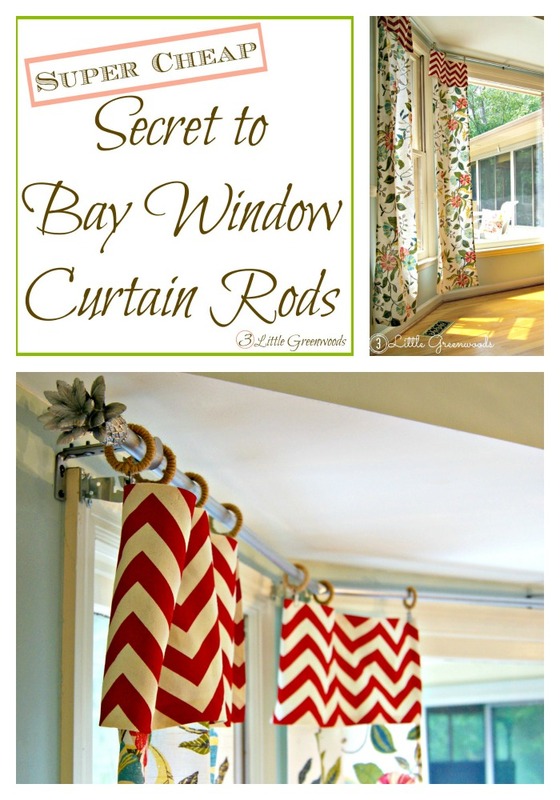 I was out window shopping at Pottery Barn when I spotted a grass covered basket and embroidered polka dot table runner. Of course, I shrugged my shoulders at the high price tag and decided to make them myself! 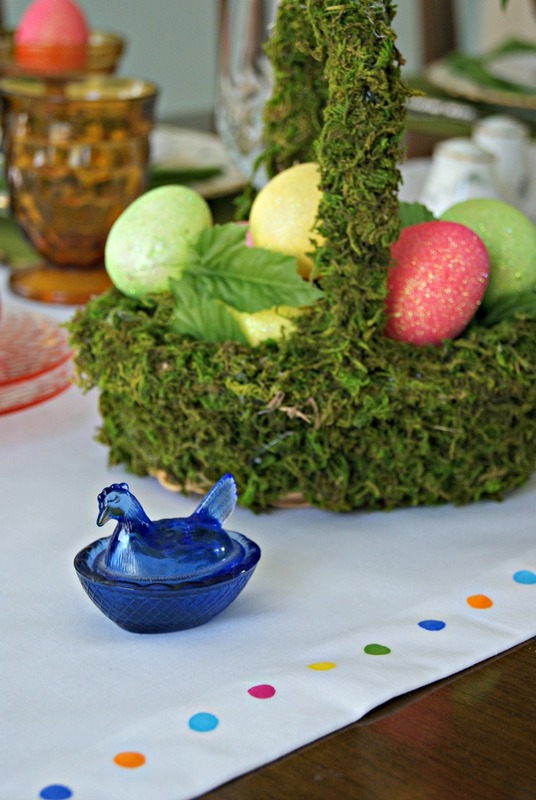 The moss covered basket was definitely a thrifty table setting idea and a super easy knock off. I love how colorful it is filled with sparkly eggs. Click here to see the entire DIY Moss Basket ~ A Pottery Barn Knock OFF! 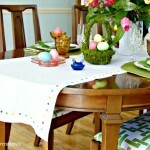 Isn’t the embroidered polka dot table runner adorable? Don’t worry! That fabulous knock off is coming soon! While it is wonderful to gather items from a thrift store sometimes you just have to pick up a few pretties! The Dollar Store is a great place for finding small accessories. Especially during the holidays. That is where I picked up the pretty Easter eggs for the DIY Moss Basket. They add a huge pop of color to the thrifty table setting and echo the colors from the centerpiece. Now that you have gathered all your thrifty table setting items it’s time to pull it all together as a fabulously decorated tablescape. Oh what’s that you say? Are you all out of decorating juice? This is when you need to “Pinterest It”! By that I mean hop on over to Pinterest and start searching for design inspiration. Heck! Take a shortcut and go straight to my Tablescapes Pinterest Board! Follow Ashley @ 3 Little Greenwoods’s board Home Decor: Tablescapes on Pinterest. I would love to know what your thrifty table setting ideas are! Please share them with me below in the comments! Aww! Thanks so much Robin! I spent yesterday afternoon enjoying your blog and all the fabulous projects. You’ve got a new follower here! I love your table and all your Goodwill tips! We would get in a lot of trouble together with our “treasure hunting” shops!!! Oh girl! We could get into SO much trouble shopping together! Come to SC to see me! There are so many things I absolutely love about this table setting. From the ceramic cabbage that fits just perfectly on your table to the wonderfully creative mossy basket knock off which by the way is amazing! You did such a lovely job. 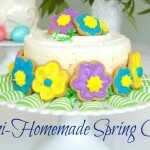 This just screams spring, Easter,, whimsy and fun! Thanks for sharing! You have great ideas Ashley!! I always love to see what you come up with! Love the Goodwill Finds. I love this table and the fabric on your dining table! I’d be afraid my kids would tear it apart but I would love to make a great set up for Easter brunch. I love beautiful table settings. The gorgeous ones you are afraid to touch. I, sadly, only have one Christmas table setting from years ago. Oh my! All of these ideas are amazing. I love how bright and colorful they are. I have recently started looking at the Goodwill for home decor and I haven’t been disappointed. The plate and mug selections are my favorites. This looks so bright and cheerful. I think we are all ready for a little Spring! I’ve been on the lookout for pretty floral plates to create a plate gallery wall in our dining room. Crossing my fingers to find a few more soon! Those egg nests are adorable!! Really really cute! Can’t wait to make some for my table! This is so me. Pinning for me to use as I decorate in the next few weeks! YAY! Thank you so much for the pin-love! You take such beautiful spring photos! Aww! Thank you SO much! Photography can be pretty tricky sometimes. 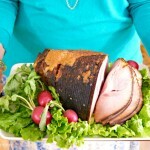 Your Easter table is just beautiful! How awesome to have ‘shopped at home’ for most of it and thrifted too! I head straight to the housewares section at Goodwill also and I LOVE the half off deals! I am going to make the adorable moss covered basket! LOVE your Easter Table. So beautiful. And I always love to save some money! Your table is absolutely gorgeous. 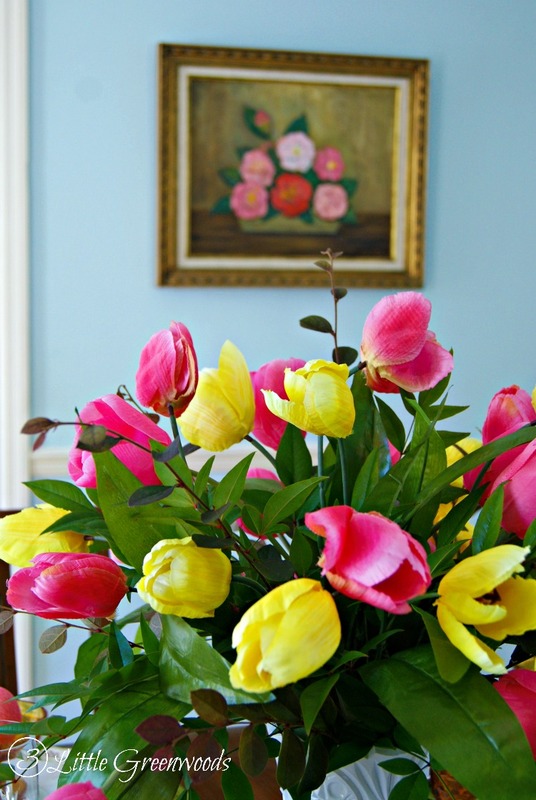 Your dining room looks like it was made for these decorations – it’s so springy and happy! Ashley your table is beautiful! I love the mix of older antique type items and newer modern ones. Everything is so light and bright! Love! Oooo. 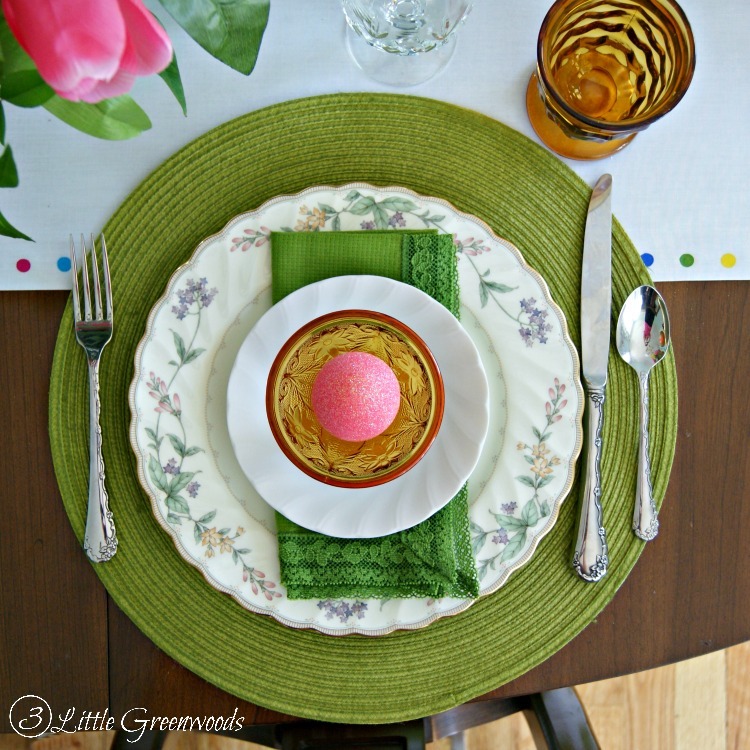 I LOVE a good tablescape and the DIY basket is brilliant! I know I have a few laying around that could benfit from this! Thanks so much! Wishing you a Happy Easter! I love your use of formal items with informal. It really makes the place settings pop! Yep! Mixing and matching formal and informal is wonderful for a thrifty tablescape! 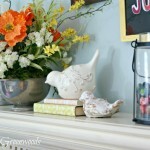 I love your spring table and all of the thrifty decorating ideas! This is my first visit to your blog and I really like what I see here and on your Pinterest boards! Thanks for the inspiration and great ideas….I look forward to visiting again! Welcome, Lanita! I am so excited to have you here and love that your left a wonderful comment on my thrifty table setting. 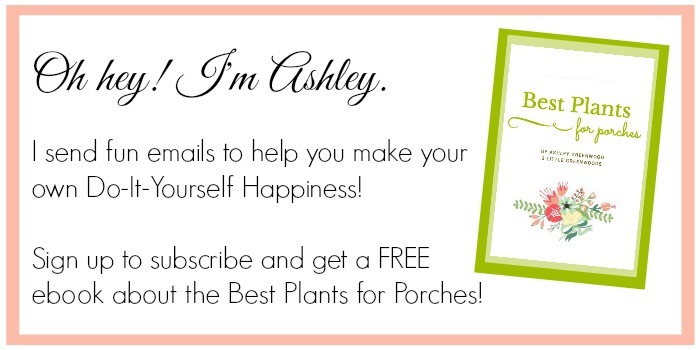 I would love for you to sign up for my weekly newsletter! Ashley, I LOVE your tablescape! So Beautiful! What a great idea with those plastic vases. The white paint makes them look expensive! Happy Easter, Kalyn! 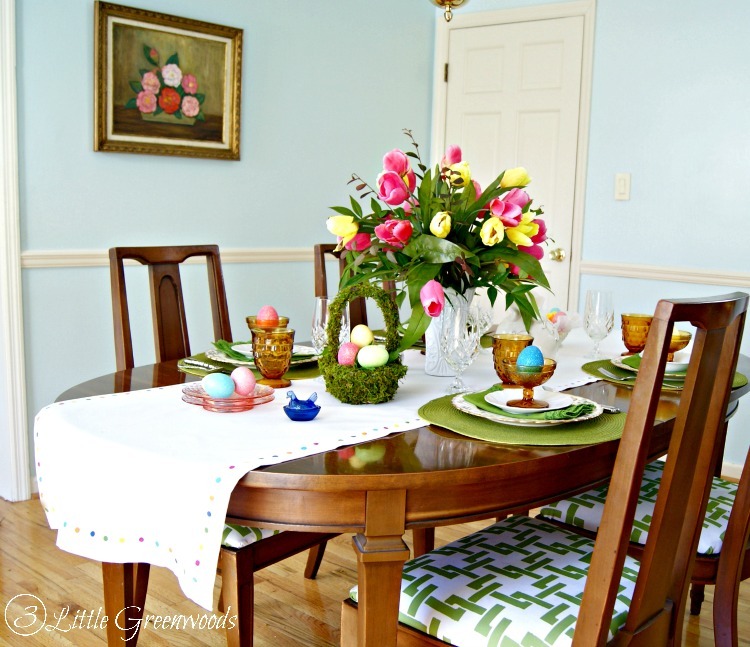 Thank you so much for the wonderful compliment on my thrifty Easter table setting! Love these tips. Thank you for sharing at Merry Monday! Ashley this is gorgeous!! Love the tips. Thanks for sharing with us at The Creative Circle. Hope to see you this week. Ashley, What clever ideas! 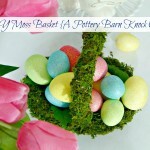 I love the moss covered basket…I NEVER would have thought to make it myself! Simply adorable….and the painted plastic vase looks shabby and vintage. Who knew? 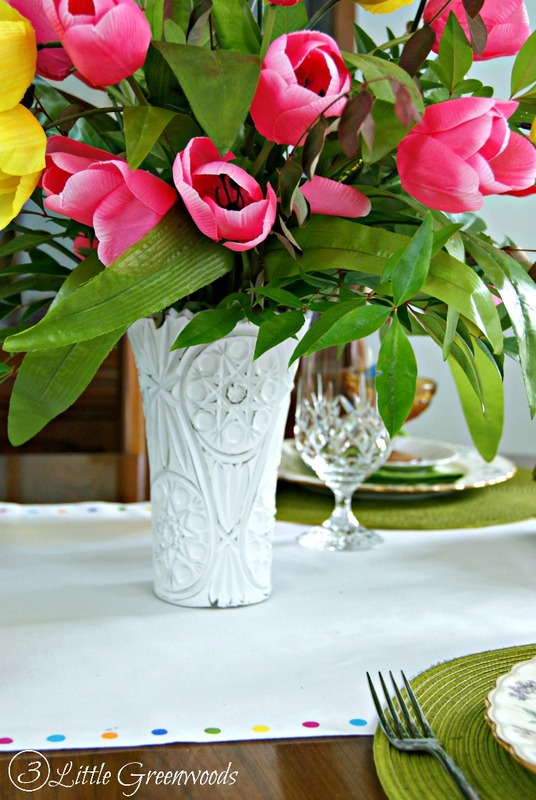 I pass over the plastic at Goodwill all the time…I’ll be looking at them differently from now on….Your tulips arrangement is perfect for the table..I love Nandina filler, too… Great Post! Happy Easter! Your dining room looks so colorful and lovely! Perfect for Easter. 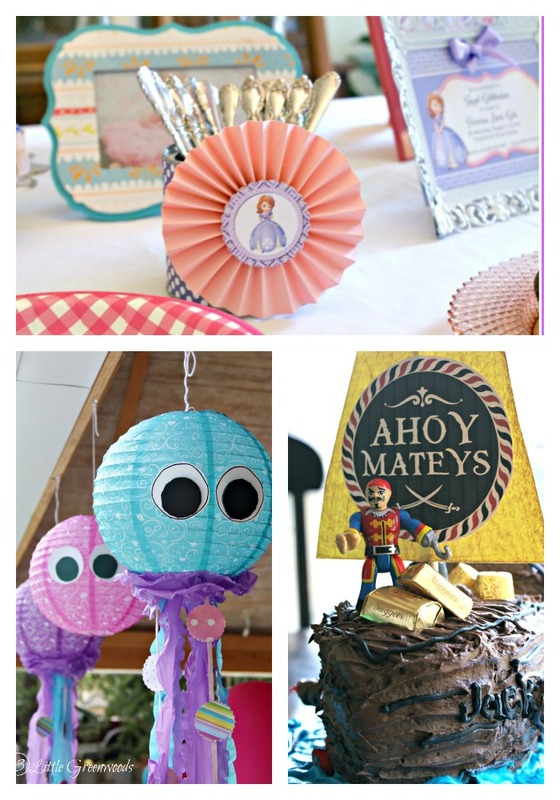 Thanks so much for sharing this at the Frugal Crafty Home Blog Hop–you know we love thrifty ideas like this!